this game was originally created as a valentine’s card for Webesteem. You are a cute pink angel, however your task isn’t so nice. 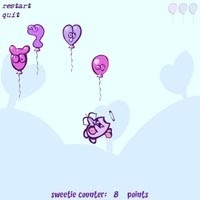 Try to destroy as many balloons as possible before they escape. There are also some candies to destroy for extra points.